Putting on contacts can sometimes compromise your eye health if you don’t take proper care of the products you use. One way to ensure eye care is by using eye drops that will eliminate any causes for harm or infection. The Biotrue Contact Lens Solution kicks off the list of the best eye drop for contacts. These drops are made to match the same formula as eye tears with similar pH levels. This means that these drops will not hurt your eyes or cause any risks. Additionally, the lubricant will hydrate your contacts which will make them easier to wear for up to 20 hours. Biotrue Eye Drops also incorporate a dual disinfection system to make them safe to wear. These eye drops have also been used by many people and 9 out of every 10 customers are satisfied with the results. You will neither feel the irritation nor itchiness that some eye drops can cause. Hyaluronate is a substance naturally found in the eyes which provides moisture to your eyes for blinking without irritation or itching. The second product on this list of the best eye drops for contacts is the Blink Contacts Lubricating Eye Drops as they feature the same ingredient so your contacts are fully moisturized when you put them in your eyes. In addition, there are electrolytes in this formula which are also found in natural tears in human eyes. Blink Eye Drops for Contacts will sterile and disinfect the contacts in addition to forming a moisture cushion for eyes. These eye drops provide a tear-free and non-irritant formula so you can wear eye contacts for a long time. 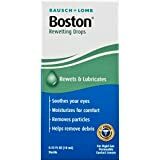 Another product on the best eye drops for contacts list is the Boston Rewetting Drops. These are made specifically for rigid gas permeable contact lenses to eliminate irritation. They are also made from a patented formula for maximum disinfection of lenses. In addition, these drops will coat the lens with a natural tear layer for premium protection that will guard against irritation. This feature helps in wearing the contacts for a long time. This is a soothing formula that will feel refreshing for the eyes instead of causing distress. 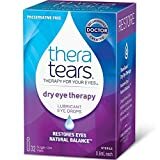 Thera Tear Dry Eye Therapy is the next product on the best eye drops for contacts list. These drops will provide hydration to eyes for as long as you wear them. They will also give a soothing effect to your eyes when you wear them so your eyes do not itch. This formula is useful for soft and rigid gas permeable contacts to provide maximum comfort when you wear them. These are also made free from any preservatives that can harm the eyes in the long run. Besides the refreshing and moisturizing effect, they will sterilize contacts for hygienic use. Thera Tear Eye Drops are effective and beneficial for anyone who uses contacts lens instead of spectacles or glasses in their daily routine. Refresh Contacts Eye Drops are on the best eye drops for contacts list as they work dramatically in favor of providing a refreshing feeling when you put your contacts on. As soon as you put your lens in the drops, they will start to sterilize as well as moisture so you can have a protective layer of hydration when you wear them. In addition, they are made from a natural tear formula and the liquid will be gentle on the eyes. It mimics the naturally occurring substances forming a protective layer. You can use these eye drops if you wear contacts often and need to sterilize and moisture them frequently. They are also considered one of the best among doctors. Another product on the best eye drops for contacts is the Clear Eyes Contact Lens Relief. These drops are specially made to avoid redness, dryness and irritation of eyes. They will keep the contacts moisturized for up to 12 hours allowing you to wear them for a long period. If you are tired of feeling itchiness and discomfort when you wear lens, it is best to switch to drops that are closer to natural substances found in eyes. Clear Eye Drops for Contacts will provide a cooling effect when you put lenses on so your eyes feel relieved and refreshed. Additionally, you will notice that your eyes are hydrated because of the protective layers provided to your contacts through these drops. ReNu Eye Advanced Formula features trip-disinfectant formula to promote maximum protection for the eyes from unhygienic build-up. Considered one of the best eye drops for contacts, they will moisture and condition your lenses before each use shielding your eyes from reddening or itching. In addition, a conditioning layer will further keep you from feeling discomfort or itchiness throughout the day that lenses can cause sometimes. ReNu Eye Drops work for up to 20 hours and keep your eyes refreshed. They will provide a relaxing effect to your eyes as well. These eye drops serve as great lubrication for people who wear contacts instead of glasses each day, earning them a position on the best eye drops for contacts list. It is natural for contacts to dry out but it can cause discomfort to the eyes that can be bad for eye-health. However, with Visine Eye Drops for Contacts, you can easily counter this problem as they will provide essential hydration to keep your eyes feeling refreshed. They will keep contacts soft so they easily merge with eye shape as well. Plus, Visine Eye Drops will provide clarity of vision and sterilize them for healthy and clear eyes so you can use them for up to 12 hours. Opti-Free Puremoist ranks among the best eye drops for contacts as they are specifically made to fight actively against microorganisms that cause eye infections and other problems. These drops are made from a hydraglyde formula that provides maximum hydration to eyes by creating a safe layer that provides comfort. In addition, this is an all-day formula so you can wear lenses for as long as you need. Opti-Free Eye Drops will sterilize contacts as well as keep them soft. They will also provide a cooling effect when you wear lenses and prevent against any redness in the eyes. They are also made specifically to suit people who need to wear contacts for a long period. Equate Saline Solution rounds up this list of the best eye drops for contacts. These will safeguard soft contacts before every use and are specially made to suit the needs of sensitive eyes. Some people get teary or red eyes with most contact drops. However, these drops will cater to such people. They will soften your lens and make sure that they do not trigger your eyes to water or tear-up. 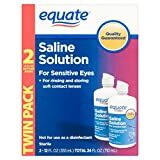 Moreover, Equate Saline Solution eye drops will also rinse your contacts for clear vision every time you put on your lens. It will allow you to wear contacts throughout the day instead of causing irritation. The best eye drops for contacts will reduce the risks that come with wearing eye contacts. Moreover, they will improve your experience thus offering you longer time span spent with lens. You will feel more comfortable and confident with the help of these moisturizing eye drops.